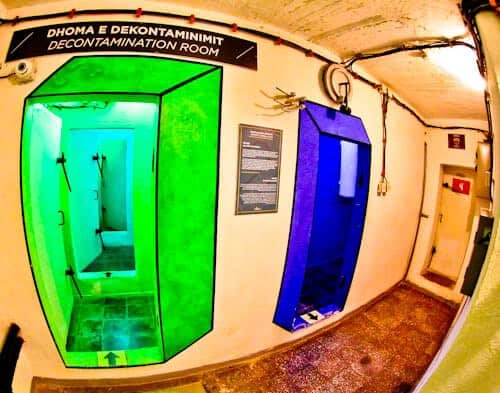 As the nuclear bunker is located adjacent to Skanderbeg Square, I recommend staying within walking distance. I visited Tirana on a day trip from Durres where I was staying next door to a Roman Amphitheater in Amfiteatri Hotel. 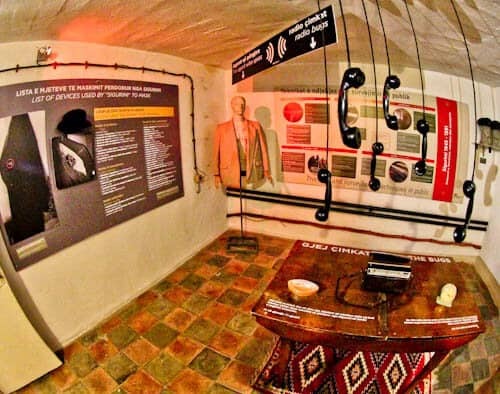 The cold war nuclear bunker is located a few steps from Skanderbeg Square. 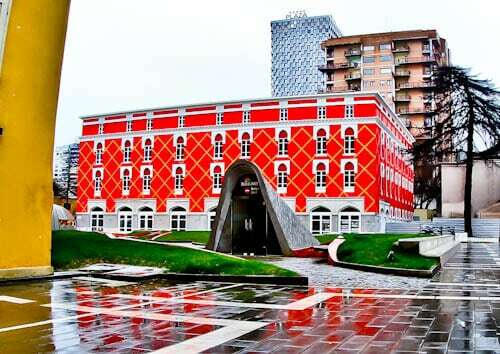 It’s in between 2 colorful Tirana buildings which are points of interest in themselves. In fact, one of them is the Albanian Ministry of Internal Affairs. The entrance is a small dome shaped building with stairs leading underground. The exit is located around the corner a few yards away. When you descend into the bunker be sure to look up because there are pictures of some who died under the Enver Hoxha regime. 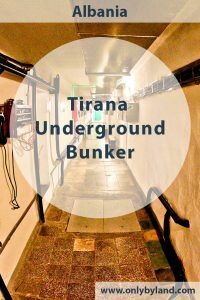 There has been a nuclear bomb in Tirana therefore you descend into the secret nuclear bunker. Where is the first place you need to visit inside the bunker? The decontamination room of course! Nowadays however, the historic entrance is the exit. 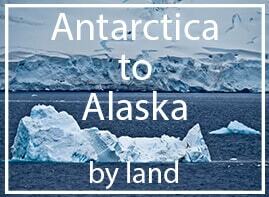 For this reason you’ll be decontaminated towards the end of your visit! This is definitely an Instagram spot in Tirana. As you enter the bunker, you’ll be impressed with its size as well as the long hallways and interconnecting rooms. The first rooms are full of information about the Gendarmerie and Albanian police. When Albania declared independence from the Ottoman Empire in 1912, it needed policing. 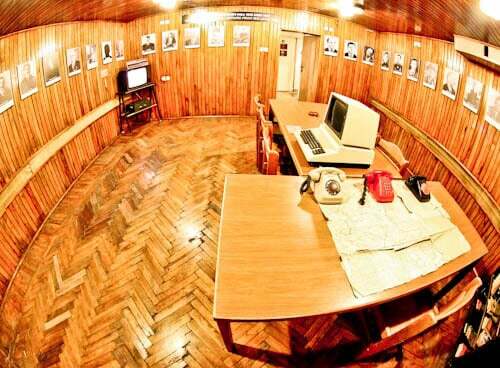 The first rooms you’ll enter explain the life of the Albanian Gendarmerie. As an example of how turbulent this part of the world was during this period, World War I started with an assassination in nearby Sarajevo. World War II is described as the fascist invasion of Albania. The Pyongyang war museum in North Korea have a similar description for the Korean war. 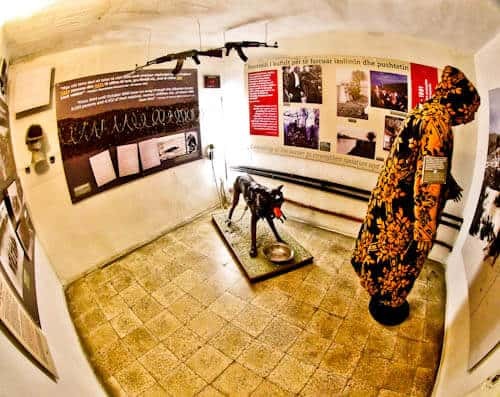 In these rooms you can learn about Albania during World War II. There is a room with wooden furnishings, much grander than the rest of the bunker. In fact this is a suite area made up of several rooms. You would think this area was reserved for the Albanian dictator himself, Enver Hoxha but he died before the bunker was completed. What can only be described as communist era music, is played on a loop in these rooms which gives them an eerie feel as you explore them. You’re almost transported to another era! If you were a foreigner in Albania it’s highly likely you were being watched. You would even be spied on during an innocent trip to the barbers. When I say spy material fit for James Bond, I’m referring to the Roger Moore era. There are a few rooms full of spy equipment from this cold war era. Interestingly, there are a few interactive quizzes here which ask you to search for the hidden spy equipment. For me, this is one of the most interesting parts of the bunker. When I visited the nuclear bunker, I was alone, it was winter and it was cold. The last thing I expected to see when I entered a room was an early version of Robocop wearing a gas mask. Nevertheless, this is an definitely an Instagram spot in Tirana, perhaps even a robot selfie spot! The fact there’s a room large enough to include a movie theater shows how big the nuclear bunker is. 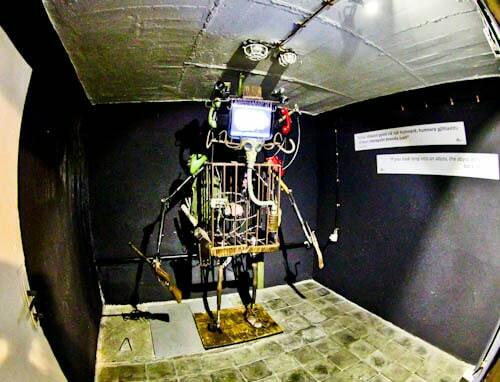 In this room you can watch a short film about the history of the bunker and of course, life under the Enver Hoxha regime. However, this would make a very unique conference room / meeting room for those doing business in Tirana, Albania. 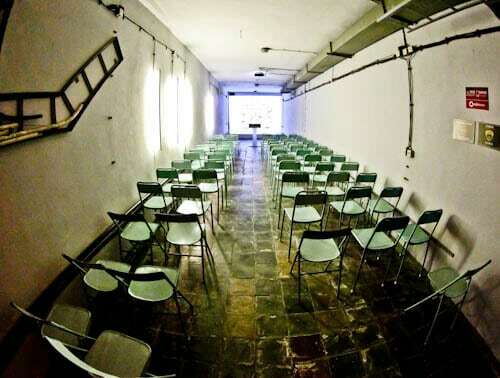 Instead of holding your conference in a modern hotel, how about contacting Bunk Art 2 to organise an event in the nuclear bunker? 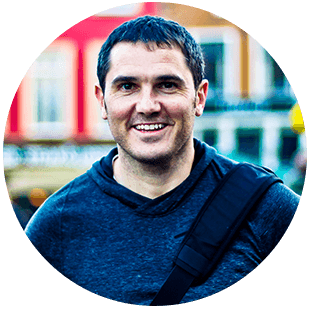 This would be a once in a lifetime experience, not to mention, motivational for your staff. 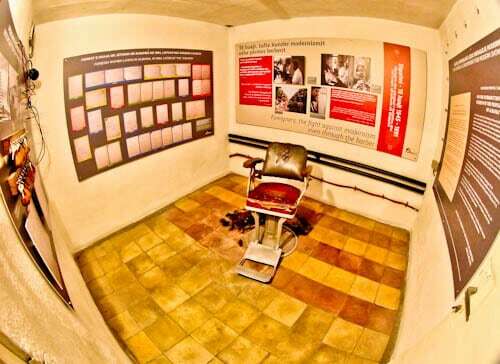 The entrance fee is incredibly low and where else will you have the opportunity to explore an underground nuclear bunker? Just look for the small dome shaped buildings adjacent to Skanderbeg square.